We are all good, not too much has changed around here. We are still in Hawaii (3 1/2 years now) and loving every minute of it! Ever since we hit the 3 year mark whenever I answer the question "How long have you been here?" I am immediately asked "Are you leaving soon?" because the average time at any duty station is 3 years. We will still be here for a while, we don't yet know when or where we will go next. I want to make the most of the remaining time we get to live on this beautiful island! Hubby and I have finally taken up hiking! I was very hesitant at first I had not gone hiking since I was a teenager and it's majorly out of my comfort zone but I'm hooked! Whenever Hubby has a day off and the kids are in school we plan on going! We have only done 2 so far but plan on doing a few more next month! We have taken the kids on one easy paved hike so far. More details and pictures on all that later! 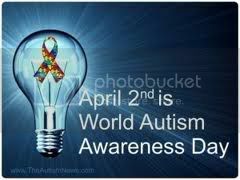 We (myself, hubs & kids) will all be participating in the Autism Walk which in Hawaii is on April 20th! I'm really looking forward to it, it will be our first year participating and I myself have never been involved in an event like that! I'm excited! Where do you go hiking? I went hiking once on Oahu and I thought I was going to die. lol... Those trails are gruesome.